The UHANS H5000 is an inexpensive phone with a huge battery. It costs only slightly over $100 and its battery is 4,500 mAh — nearly double most modern smartphones! It might sound too good to be true, but it certainly makes concessions in other areas. Let’s take a closer look at the UHANS H5000 and see if it’s worth it. The first thing you’ll notice about the UHANS H5000 is that it is bulky. At nearly half an inch thick, it’s noticeably thicker than most other smartphones. It has a bit less height and width compared to other smartphones, though, thanks to its 5.0″ screen (most phones are shipping with 5.5″ screens now). Unfortunately, that screen is only 720p, meaning everything feels a little blurrier and more pixelated than you might be used to. Colors also tend to look washed out, but at least it gets reasonably bright. There’s also a thick black border around the screen that’s just distracting and makes the screen feel smaller than it is. The H5000 is made entirely of plastic and has a removeable back that houses the dual SIM card slots and the microSD card slot. The body seems sturdy however, and doesn’t creak when you put pressure on different areas. On the bottom of the phone, you’ll find two speakers. The right side has the power button and volume rocker, but the volume rocker is poorly designed and difficult to press in either direction. There’s no solid click noise or feel. On top, there is the headphone jack and microUSB port. That’s right, the charging port is on the top. It’s definitely a unique design choice that could take a little getting used to. Also note that this device uses microUSB and not the newer USB Type-C What Is USB Type-C? What Is USB Type-C? Ah, the USB plug. It is as ubiquitous now as it is notorious for never being able to be plugged in right the first time. Read More . Basically, with the H5000, what you see is what you get. It looks and feels like a cheap phone with a big battery, and that’s what it is. The rear-facing camera is a solid 13 MP and the front-facing camera is 8 MP, but neither of those produce pictures worthy of those numbers. Megapixel counts have essentially become pointless in the smartphone camera race. These cameras are just not great. The front-facing camera is particularly awful in low-light, and even the rear-facing shooter shows some noise in relatively well-lit photos. One odd quirk I did notice about the rear-facing camera was that its auto white balance capabilities were noticeably more accurate than other smartphones I’ve tested. It just produced realistic colors for the scenario, but if the lighting was less than ideal, there was a fair amount noise in the photos anyway. The camera interface itself is nearly stock Android, though given a few little tweaks. For instance, you can use a peace sign to activate the shutter. With two speakers along the bottom of the device, the H5000 actually manages to produce some decent audio. It’s tinny, as you’d expect from any smartphone, but it gets just as loud if not louder than other mainstream smartphones. And that’s all you can really ask for at this price point. Though the H5000 is running nearly stock Android, some unusual changes have been made. For example, Android used to have a Gallery app that was later replaced by Google Photos Get Free Unlimited Photo Storage & More with Google Photos Get Free Unlimited Photo Storage & More with Google Photos If you aren't using these hidden Google Photos features, you're really missing out. (Hint: There's free and unlimited photo storage!) Read More , and a Messaging app that was later replaced by Messenger Text Better With These Alternative SMS Apps for Android Text Better With These Alternative SMS Apps for Android Don't like your default SMS app? Try a new one! Read More . But in UHANS’s version of Android 6.0 Marshmallow, those dead apps have returned from the grave. It kind of makes it feel like you’re using an older version of Android, even though you’re not. It also uses the AOSP What Is Rooting? What Are Custom ROMs? Learn Android Lingo What Is Rooting? What Are Custom ROMs? Learn Android Lingo Ever had a question about your Android device, but the answer had a bunch of words in it that you didn't understand? Let us break down the confusing Android lingo for you. Read More default launcher (called Launcher3) rather than the new Google Now Launcher. There’s a built-in file manager app The 7 Best Free File Explorers for Android The 7 Best Free File Explorers for Android There are a bunch of file management and file exploring apps out there for Android, but these are the best. Read More that’s grey and dull, and the Recents view has a clear-all button. Aside from that, it’s basically stock Android. UHANS even went with software keys, which is a relief when so many budget Android phones have awkward capacitive keys. Another strange tweak is the persistent notification that’s present if you have App Permissions enabled What Are Android Permissions and Why Should You Care? What Are Android Permissions and Why Should You Care? Do you ever install Android apps without a second thought? Here's all you need to know on Android app permissions, how they've changed, and how it affects you. Read More . This is something that I also noted in my review of the Blackview R6 Blackview R6 Review Blackview R6 Review The Blackview R6 has a lot going for it but lacks a few important features that would otherwise make it an exceptional buy. Read More , and it’s made a return here with the H5000. You can turn off App Permissions to get rid of the persistent notification, but that would mean granting apps access to whatever permissions they want — and it’s frustrating that users otherwise have to live with this constant notification. With a MediaTek processor and 3 GB of RAM, the H5000 is not exactly a speed demon, but it does fine. I scrolled through web pages on Chrome, watched videos on YouTube, played some games, and it managed to keep up. There was a bit more lag in its scrolling than with higher-end Android devices, but not to a degree that it became unusable. It even did a decent job of keeping apps in memory while multitasking. I could see it getting bogged down over time if you let your device become overridden with apps 5 Apps That Really Clean Up Your Android Device -- And Aren't Placebos! 5 Apps That Really Clean Up Your Android Device -- And Aren't Placebos! Read More using background services, but if you’re taking care of your phone, it should get you through the day just fine. One note for the American readers: this phone doesn’t have the proper bands for 4G LTE in the U.S. It has bands for the 800, 900, 1800, 2100, and 2600 MHz ranges, which should work fine for most folks outside of the U.S. (Be sure to check with your carrier, though.) Unfortunately, American carriers only use the 700, 1700, and 1900 MHz ranges. You’ll still be able to use Wi-Fi and access 3G data speeds, but 4G LTE in the U.S. isn’t available. The 4,500 mAh battery in the H5000 is enormous, and it could easily last two days with medium usage, maybe longer with light usage. When I spent a day using it to its max, it lasted around 24 hours with over eight hours of screen on time before it even dropped to 17 percent. That’s impressive. 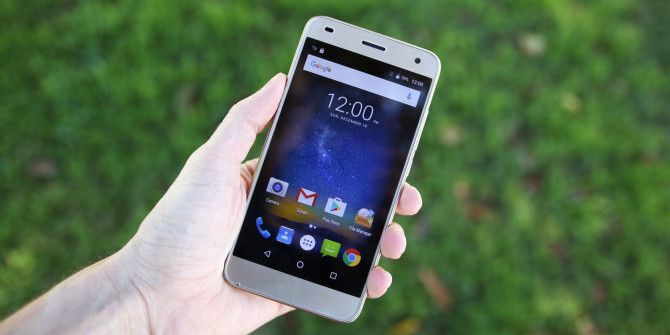 Unfortunately, the lack of USB Type-C means this phone is far from futureproof What Can You Shove In a USB C Port? What Can You Shove In a USB C Port? Look closely at the ports on your laptop. If you bought one in the past year, you'll notice a tiny, rectangular port you've probably never used. That's the USB C port. Read More , since that’s the standard we’re moving to. Plus, there’s no quick charging, so this phone can take up to four hours 4 Tips To Increase Smartphone Charging Speeds 4 Tips To Increase Smartphone Charging Speeds Faced with a low battery warning right before you need to leave? These neat tricks can help you charge your smartphone faster than usual so you aren't left with a brick in your hand. Read More to get fully charged. If you only have $100 to spend on a phone and you need something that’s going to last you for a few days on a single charge, it’s a wonderful option. Very few phones manage to carry such a large battery. However, if you live in the U.S., you probably want to skip it due to the lack of proper 4G LTE bands. It also has weak cameras and a mediocre screen, but for as cheap as it is, you can’t expect it to be perfect. The appearance and the functionality of the UHANS H5000 I'm interested in the I ordered it myself. I think it will not disappoint. i really like the smartphone. according to me 9/10. price, performance , and look is perfect. The smartphone for the price is good. He will be able to cope with most of the tasks that apply to the budget smartphone. And of course, it is equipped with a huge battery. This allows it to operate autonomously for a long time. On the official website of the manufacturer indicated that smartphones UHANS H5000 buyers set for February 12, 2017 onwards. Until February 1, 2017, the company carries out the action on the sale of smartphones. Flash Sale Price $104.99. great smartphone for the price. I never see the price of the smartphone with the features. 3GB RAM 32GB ROM, 13MP camera, 4500mAH battery and etc. The UHANS H5000 is an inexpensive phone with a huge battery, 3GB RAM, 13MP Camera and etc. I love it because of battery life and quality camera. Perfect timing for me. I just dropped my phone which totally shattered my phone and my sanity. Desperatly need a new phone being a single mum on a illness disabilty. Can't afford to buy a phone anytime soon. This Phone i have newver heard of but it sounds fantastic. I love the overall style. I like the battery usage, and it thin with great features, I use an iPhone 4s battery doesn't last long don't like key pad no good for thick fingers. I should get one for my grandpa he lives outside of the US and just broke his phone. You neglected to mention which cellular bands this covered (US/CAN, UK...) and whether it's GSM or CDMA. "One note for the American readers: this phone doesn’t have the proper bands for 4G LTE in the U.S. It has bands for the 800, 900, 1800, 2100, and 2600 MHz ranges, which should work fine for most folks outside of the U.S. (Be sure to check with your carrier, though.) Unfortunately, American carriers only use the 700, 1700, and 1900 MHz ranges." And it's GSM. Most networks outside of the US (where Verizon and Sprint are CDMA) are GSM, so unlocked phones like these are almost always GSM. When you REALLY need a cheap phone with no complications but all the usual features, this one will serve. As it happens, that is EXACTLY what I need. Nice giveaway! Good luck everyone.